Color me Seasonal: Edition EP! My book baby is born today, Edible Paradise: A Coloring Book of Seasonal Fruits and Vegetables (Universe). Now go forth and color! NYC! Don’t miss my signature and coloring extravaganza this Thursday, March 17th from 5-7pm at The Vale Collective in Williamsburg. Columbus, OH! I’ll be signing books Wednesday, March 23rd at 6pm at Book Loft. Chicago! Come color with me and get your book signed March 26th at 2pm at 57th Street Books. I’m going to commit a blogging sin and reuse my header from last year. Hold onto your teeth! It’s galette de rois season! 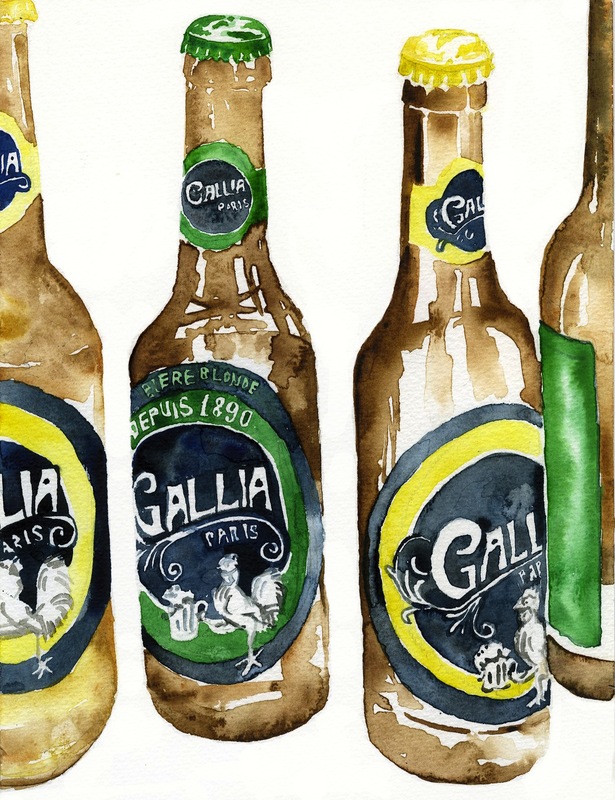 Even amongst the resolutions to drink soy milk and take tai chi, the galette de rois is the official mascot of the month of January in France, in celebration of epiphany. Every event, birthday party or gouter revolves around the puff pastry confection, enveloping a rich layer of dense almond cream and a lucky porcelain charm. Whoever bites into the charm is crowned king or queen for the day. As I like to say, the object is to win the crown and not get a crown, if you know what I mean. I don’t condone comfort eating, but lately it’s been the only way to remedy the frightening events of the past few weeks in Paris. I’ve reverted to cooking in times of crisis. Concentrating on a few ingredients at hand takes my mind off the fear and back into the present. My galette de rois was no exception. With an almond objection in our home (hello husband! ), I swapped out the traditional filling with a homemade apple compote, warmed through with cinnamon and a splash of brandy. I didn’t have a porcelain charm hanging around my kitchen. My two options were either inserting a 5 centime coin or an almond. I took a risk and added the latter. Sure enough, there was no crowned king or queen this year. Someone ate the almond and didn’t complain. And I’m pretty sure it wasn’t me. 1. Preheat oven to 350° F. Cut the vanilla bean in half lengthwise and scrape out the seeds using the side of the knife. Discard the pod. Mix together the compote, vanilla seeds, brown sugar, brandy and cinnamon until fully combined. 2. Roll out 1 puff pastry on a cookie sheet. Spread the compote mixture in the center of the puff pastry, creating a 2-inch border without compote around the circumference. If using a charm, press it into the compote. Brush the circumference of the pastry with the beaten egg. Cover the compote with the second puff pastry. Press the edges to fully enclose the filling. Using a paring knife, lightly score the top of the pastry with a geometric pattern and make several holes to help the steam escape while cooking. Brush the top with the remaining egg. Sprinkle with cane sugar. Bake for 30-40 minutes until the top is golden brown and the pastry feels crisp to the touch. Cool before serving. Rhubarb has always had mythical qualities to me. It was something reserved for pies sold in rickety roadside stands on our roadtrips to Michigan in the summertime, far away from my city home. 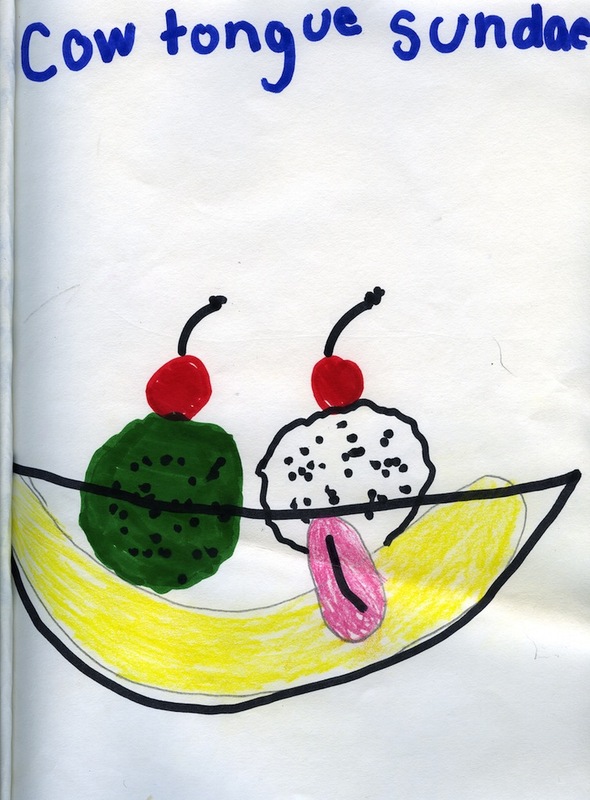 My 5th grade teacher made no effort to promote rhubarb awareness. Although it was Lutheran school, Mrs. Hawk had the scare tactics of a nun. I avoided brushing my teeth for months after she declared that toothpaste could burn a whole in human skin. And after stating that rhubarb leaves were poisonous (is this even true? ), I had zero desire to attempt eating the celery of the fruit world. I filed it away in my brain with poison ivy and all other fears of the natural world I had as a city kid. Fast forward to now; my cheeks are practically blushing from eating so much rhubarb this season. My local producteur (aka my local rhubarb dealer) has taken quite the liking to me. He never lets me pay over 10 euros for my seasonal fruits and vegetables of the week. His affection has become quite public, exclaiming he loved me in front of all his jealous, little old lady customers. “I love your products!” is my platonic way of reciprocating, waving as I walk away weighed down with a week of fruit and veg. Nevertheless, rhubarb has found its way into my selection at least once a week. Seeking out inspiration, I recently found my recipe book, a comforting reminder of all of my mom’s legendary collection of cookie recipes. Her buttery apricot jam oatmeal bars are a revelation, like two buttery oatmeal cookies sandwiching a chewy, super-concentrated layer of fruit preserves. No offense Smuckers and Blue Bonnet margarine, but I could only imagine what could happen to this recipe with a beautiful French jam and some really good butter added to the mix. But with a growing stock of rhubarb compote in the fridge and little interest from my significant other in helping me out (Q: Rhubarb? A: BEURRRRK! ), I updated one of my favorite childhood treats to match my new obsession. I can confirm it is a perfectly portable addition to any picnic, too. 1. For the compote, add rhubarb, sugar, lemon juice, water and salt in a heavy-bottom saucepan over medium-low heat. If using vanilla bean, slice in half and scrape the pod with the tip of a knife to remove the seeds. Add the seeds and remaining bean to the saucepan. If using vanilla extract instead, add now. Bring the mixture slowly to a boil, stirring occasionally. Simmer for 15-20 minutes until the rhubarb is tender and the mixture has reduced. Let cool. Remove the vanilla bean. 2. Preheat oven to 350° F/175° C. In the bowl of a food processor, mix flour, baking soda, salt, nutmeg, brown sugar and oats until combined. Drop in the pieces of butter, pulsing after each addition. The mixture should resemble a rough pie dough with pea-sized pieces of butter in it. Be careful not to overmix. If making by hand, mix the dry ingredients together with a whisk. Cut in the butter using a pastry cutter or with fingertips until incorporated. Reserve 1 cup of mixture. 3. Press mixture into a 9’’×13’’ pan. Spread with rhubarb mixture in an even layer. Sprinkle with reserved oat mixture. Bake for 35 minutes until the pastry is golden brown and the rhubarb is bubbling. Let cool before slicing into squares. Yes, this might be one of those nostalgia-inducing posts only people who post childhood profile pictures can appreciate. 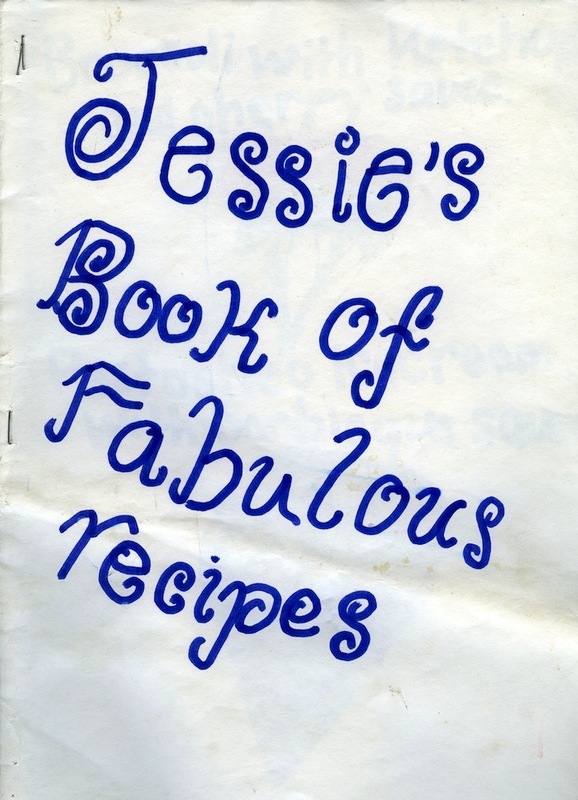 But on a much overdue trip back to Chicago after 4 years, I found something even better than a letter to myself in the future, Jessie’s Book of Fabulous Recipes. 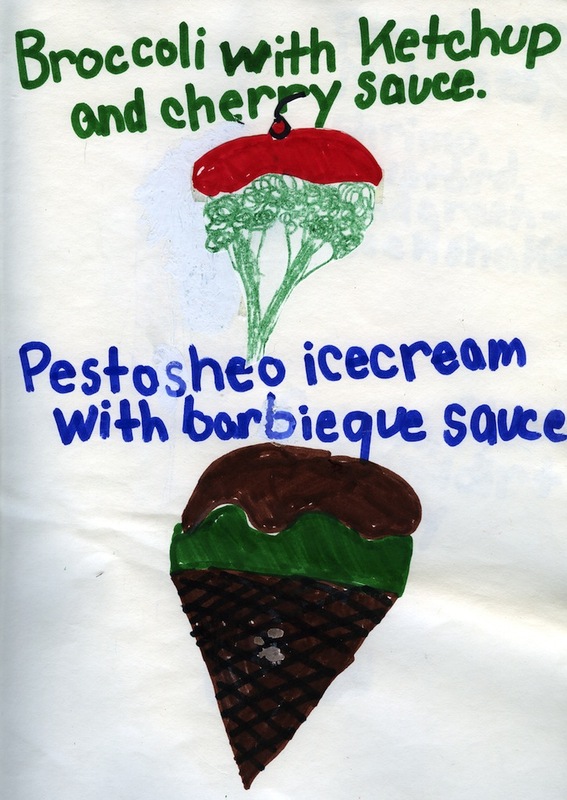 Amongst the remnants of 18 years of unrequited love in the attic of my childhood home, I found this document scarily predicting my future, all captured in beautiful food illustrations. 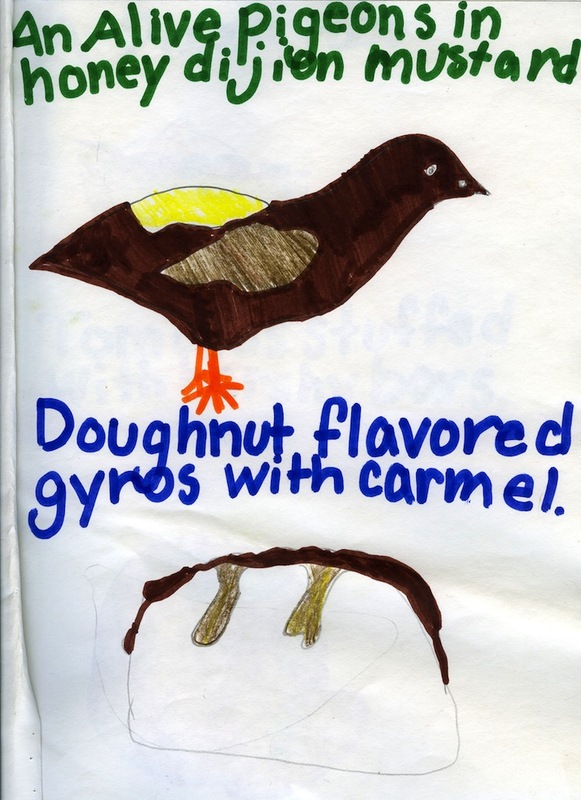 Doughnut-flavored gyros with caramel? 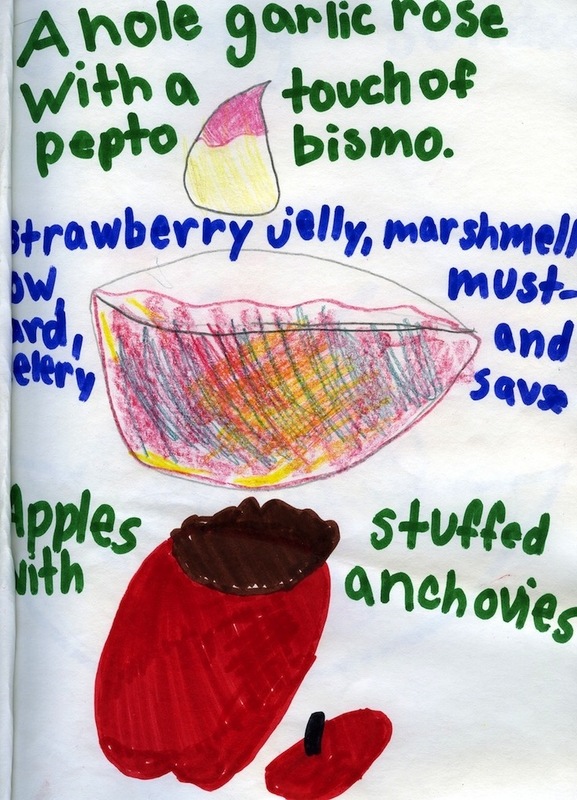 Dare I say this was a precursor to molecular gastronomy? An alive pigeon in honey dijon mustard? Dare I compare this to French cuisine?